Includes video tutorial! Pattern, video and instructions are all in English language with U.S. imperial measurements. -Eyes and Cutie Marks for the "Mane Six"
*Does NOT come with manes and tails for any pony. To re-size pattern: On your printer settings, change the percentage size of each pattern page. Above photos are for your reference. This pattern is designed for minky. Also works with fleece. 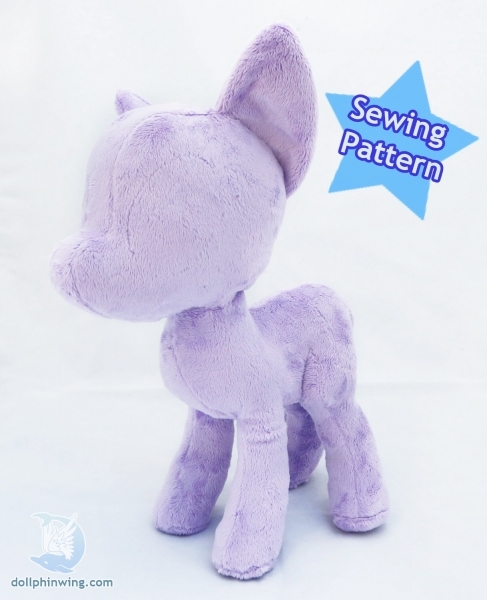 This pattern makes an 11"-12" pony and can be printed on A4 sheets of paper and can also be resized. You may alter and sell the ponies you make with this but please give credit! You are expected to at least know how to sew and use a pattern, if you don't there are many great tutorials online for that! But please know that I have put this together with people who have a basic knowledge of sewing in mind.